For me there is almost nothing better than a quiet Sunday morning with a cup of espresso and a yeast based treat. These things are magical and great pick me ups for morning grouches like me. Yeasted pastries and sweet breads are a cosy and comforting way to celebrate a holiday as well. In Germany they are an essential part of Easter. Here you can find all kinds of stuffed or plain yeast braids or bunny shaped rolls and even yeast based easter baskets with a boiled egg in the middle. For many people the soft and sweet dough is a perfect comfort food and for others yeasted baked goods are just much easier to make than a large cream or frosting based cake. Well, if you are one of those people who say that baking with yeast is complicated, get over it. It really just does take some practice and I promise you will get the hang of it. Just start. My first rolls looked and tasted like cobblestones and now look at this. In Germany cinnamon buns are not very common. We like to stuff our rolls and buns with poppy seeds, pudding, or nuts instead. This diversity and a couple of small tins of chestnut spread in our pantry made my mind wander to a chestnut and cinnamon filling for these little Easter treats. Since chestnut spread is mostly sugar, it does caramelise very nicely during baking and also makes for a wonderfully sticky filling. 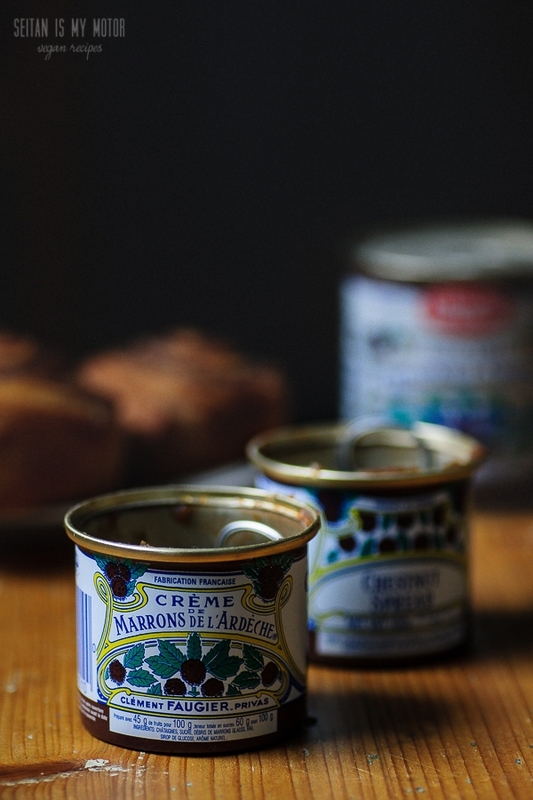 The most widely available chestnut spread is Faugier brand Crème de Marrons, which I used. (Okay, I bought it in France but I can get it at a department store in my town, too.) But you can also make your own, there are a couple of recipes online. 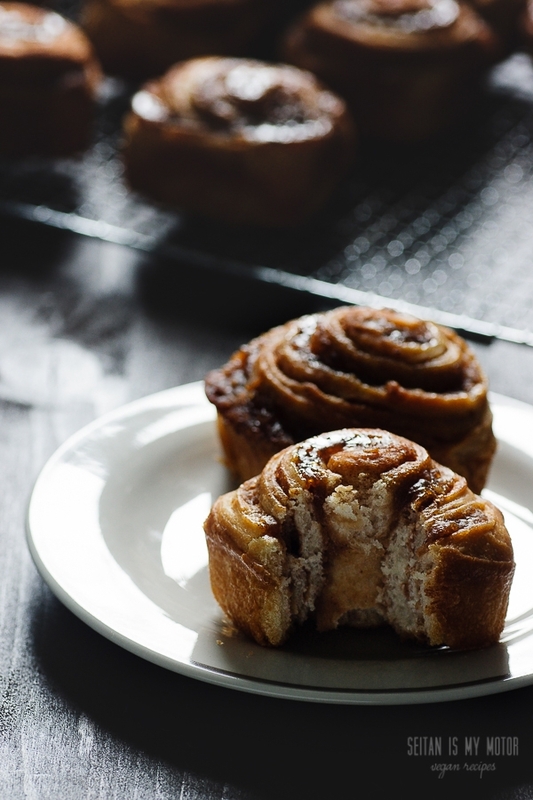 For a simple alternative use a regular cinnamon bun filling and leave out the chestnut spread. (Another idea is to substitute apple butter.) If you look at the preparation method for this recipe you will find that I have already included such a filling. So technically these could be called “double stuffed”. All this folding might look complicated to you, but it will improve the texture and make the buns a bit flakier. Of course you can skip that step and sprinkle the sugar and spice mixture right on top of the chestnut spread. Lots of variation possible here, so you can make the recipe work for you. To make the dough combine flour, yeast, sugar, and salt in a bowl and mix well. Knead dough well for about 5-7 minutes. Cover and let rest for 1 hour. Place on a lightly floured working surface and knead for one minute or so. Roll into a 40 x 30 cm (15.7 x 11.8 inches) rectangle. Combine sugar and spices and sprinkle on top of the dough. Fold the dough as if you wanted to fit it into an envelope: Fold the short side over so that you have a rectangle half the size but still the same shape. Then fold it over again to quarter the size. Roll the dough into a 40 x 30 cm (15.7 x 11.8 inches) rectangle again. Spread the chestnut spread on top and roll the dough into a log, starting with the long side. Cut the dough into 12 equally sized rolls and place them in the tins. Cover with a greased piece of plastic or with a damp kitchen towel and let rest for 30 minutes. All your ingredients should have room temperature. (The water should be luke warm.) Let your dough rise in a warm place. If your flat is cold, the dough might take longer to rise. (For your first rise, you can also put the dough in the oven. No temperature setting, just the light switched on. These are officially my go-to indulgence! It’s hard to remember to not eat too many, when they taste this good! I sometimes put a little cinnamon and cardamom in the dough too! Und die Bilder sind wie immer eine Wucht! Mit Hefeteig komme ich eigentlich ganz gut klar…aber ich für meinen Teil würde jetzt gerne rumjammern, dass mir solche perfekt geformten Schnecken sicher NIE gelingen. Aber vielleicht sollte ich das einfach mal ausprobieren, bevor ich herummeckere ;) Auf jeden Fall sehen die toll und köstlich und perfekt aus! A delicious flavouring for sure. Chestnuts provide such a delicate, beautiful flavour. I love the idea of a chestnut swirl. These are so perfectly shaped! 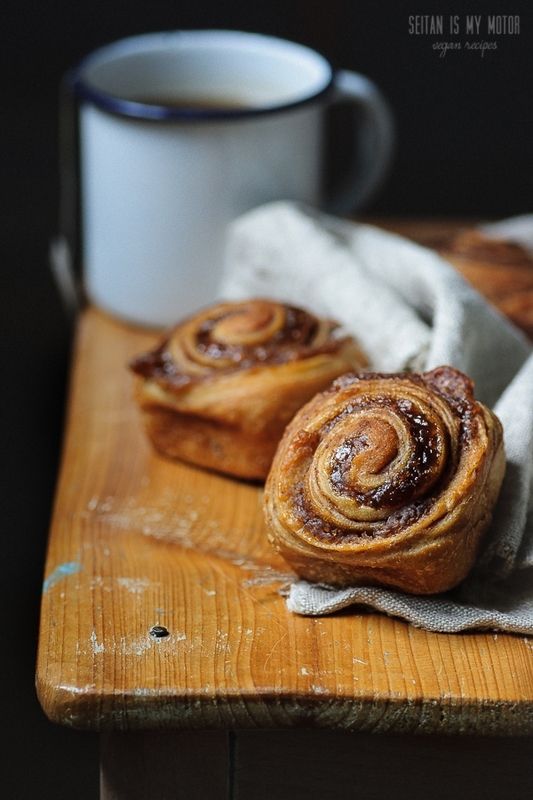 I love cinnamon rolls and buns with tall, peaky centers like that. It is just a matter of practice and familiarity with yeast – I have just put some sourdough bread in the oven and pancakes on top of the stove and it seems no work at all but the idea of layer cakes makes my knees knock together in terror because I rarely make them. Finding chestnut puree here is hard – I had a shop that sold it but it has closed recently. Possibly the city department stores sell it. I love the sound of all your german yeasty sweet treats. We always have hot cross buns at easter but I am always open to new sweet yeasty ideas. I think chestnut spread is a very French thing (so it’s not super easy to find in Germany as well) and you could basically use any filling you like for these, even a chocolate spread! Yes, I agree. It would be great if they were available all year round. Deine Variante klingt herrlich, die muss ich mal ausprobieren – allerdings backe ich meine Schneckchen seit kurzem in einer Springform. Dadurch kleben die Teile so wunderbar zusammen – herrlich! Wie frierst du die Schnecken denn ein? Ich backe sie auch manchmal in einer Form, so dass sie alle eins sind. Aber fürs Einfrieren ist diese Version besser. Ich packe einfach 3-4 in einen Gefrierbeutel. Später kann man sie einzeln entnehmen und auf dem Toaster auftauen. besteht die maronencreme zu 100 % aus maronen oder ist die gesüßt? Ich kenne aus dem bioladen, glaube ich, nur gesüßte. Ne, die ist ordentlich gesüßt. Deshalb karamellisiert sie ja so schön. Oh, I love chestnuts!! Those buns seem delicious!